Dupatta is essentially a clothing accessory forming an important part of the women from the Indian subcontinent. It is a long scarf usually made up of light weight material and sometimes is adorned with embroidery and/or ornaments to beautify the piece of garment. 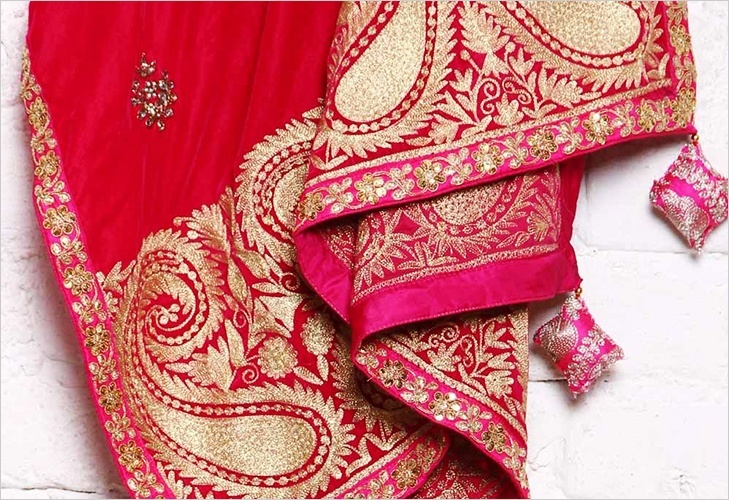 The dupatta has a very important place in the Indian traditional attire both for males and females. 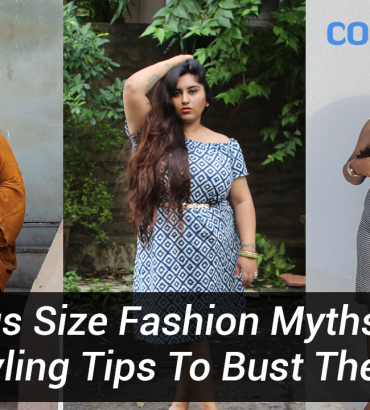 You must have seen ladies pairing their dupattas with salwar kameez set, ghagra, sharara etc. Whereas, the males often use their dupattas with sherwani or kurtas for more formal occasions. In Himachal Pradesh it is called Dhathu and chaddar in Assam. Along with their names change their draping styles. 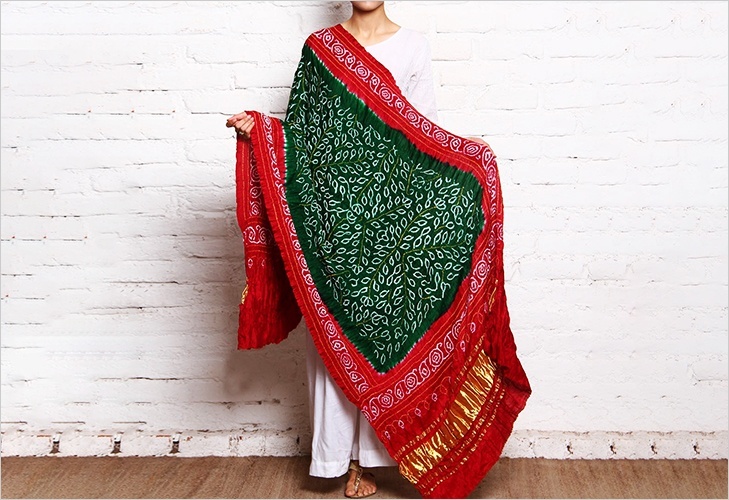 The dupatta is also known as chunni, chunari, odhani, unaa or pacheri as per the region. In Rajasthan women wear their dupattas with ghaghra cholis often tucked at the waistband of the ghaghra or the long skirt. The same dupatta is also used to shield their heads from the scorching rays of the sun. While in Southern India we can see a different usage of the same. 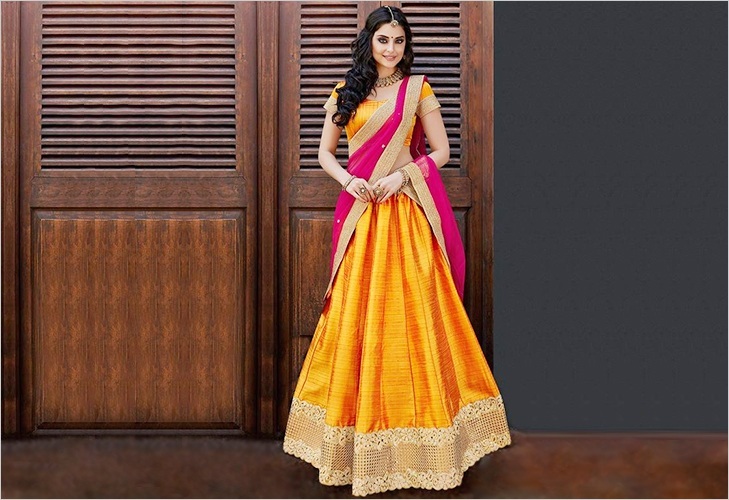 The dupatta here is worn with knee high skirts and is popularly called as half saree drape. It is hard to find any conclusive evidence related to the history of dupattas. Since no fabric traces, paintings or figurines have been obtained from ancient civilisation that can depict the usage of the garment in the said time period. Although, the vedic Indian history has some similarities with what we today call as dupattas. The vedics used to wear Vasas (garment), Nivil (an under garment), and Adhivasa (an over garment). The Adhivasa is compared with the dupattas since it was widely used by the members of both the genders to cover their upper body parts. Subsequently, the garment developed as a piece of an accessory exclusively for women as they grew more conscious of their modesty. As the evolution took place our favourite dupatta transformed from being just a useless piece of cloth to a practical piece of clothing. The billowing length was dramatically reduced to two metres to create more space for free movements. The shortening of the length made the dupatta a handy accessory that can be used in all phases of life from utility purposes to just dress up for an event. The usage of this versatile garment has altered a lot with time. But it is still used to mark respect towards the elderly members of the family or in holy chambers while praying to the god. A dupatta or a chunari can be worn in a plethora of styles varying from region to region across the subcontinent of India. Traditionally the chunari was used as a symbol of modesty amongst women. It was worn across the bosom or to cover the heads or as a veil. Fast forward to today, the dupatta has evolved itself as a fashionable accessory that takes your fashion quotient a notch higher. Today, we have no single way of draping this beautiful yard of cloth. 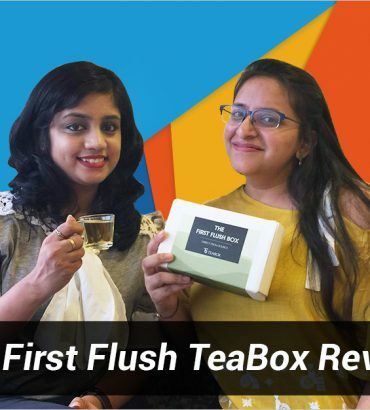 You are welcome to experiment as you please and be a trendsetter. We can also find certain exemplars where the dupatta was adorn like a cape around the torso. The variations in dupatta can be seen even in the fabric used to make them. The style and fabric of the dupatta is usually in sync with the attire with which it is worn for a balanced and polished look. With salwar kameez the dupatta is either allowed to have a free fall from the shoulders or like a semi garland resting on the torso and the end tails of the dupatta are thrown back at the shoulders. As per the current style magazines the latest fashion is to drape the chunni over your one arm to flaunt the detailing of the same. It tends to create a beautiful mesmerising look with its intricate patterns and embellishments. This imparts a very sophisticated look perfect for a formal or traditional event. For a more subtle yet chic look women opt for a shorter version of dupatta. These scarves or stoles are similar in style and design but differ in lengths making them more appropriate for a daily wear casual look. You can pair it up with kurti and jeans, Patiala salwars or flared skirts. The current fashion landscape of the urban area is flooded with the trend of sporting dupatta in myriad ways. Dupatta can also be decoded as “Du” translating to two and “Patta” meaning a cloth strip. 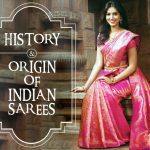 The Sanskrit origin of the word signifies dupatta as a multi-purpose veil and/or scarf indispensable to traditional garb of India. 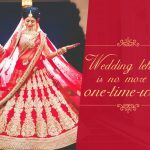 Where we can find the majority of the usage was done by women, a significant portion of male populace also used dupatta in one form or the other. Dupatta has played a pivotal role in the dressing of royal males in the past. This fine piece of clothing has long since lost its value in the casual wear but still retains its position when we talk about special occasions. The dupatta for males is often designed with coloured stones, elegant embroidery of sequins, and beads for a regal look that sets them apart. The dupatta adds richness to their look. It is essential to be worn by groom and his companions, completing their overall look. Unfortunately, men do not have a plethora of option to play around with this versatile strip of cloth. 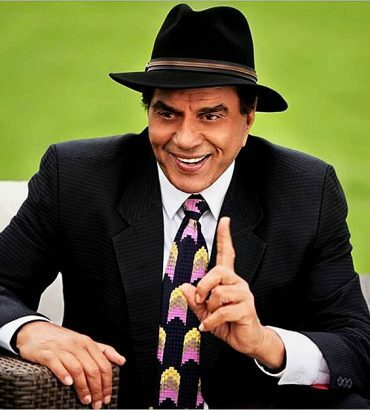 However, traditional attires can be looked upon for some great cues on how to carry them with panache. You can pair them up with a sherwani, achkans, kurtas for a traditional look. If you want to lean more towards an indo-ethnic look then a well tailored jacket with a crisp dupatta can transform your entire look to wow. By experimenting with cloth and embroidery you can easily attain the picture perfect look for any occasion. Prima facie the dupatta or chunni looks like an essential part of women and women only. But since age old times it can be seen and recognised as a part of ensembles of Rajas and Maharajas. If you want to duplicate the same regal look all you need a grandiose dupatta over your one shoulder with your Sherwani and voila! We have an in house King. For a more surreal look you can pick a stole in one colour and stiff material with no to a little work on borders to flaunt a dignified look. Just do away with stigma and rock a dupatta like you do. Albeit, the name for the garment is same for men and women but they do have some fundamental differences in their nature setting them apart. The dupattas sculpted for men are generally stiff, shorter in length and more subtle in design and colours used. 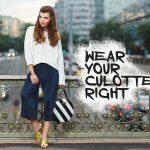 It is categorised as a casual accessory that is optional with traditional clothing. With the pleasant rising in the numbers of metro sexual men the designers have now started to play around with more colours and cloth styles making it a highlight of the traditional outfits. It is a million dollar question that how many varsities does dupatta have. The answer is too many to count. Till a few decades back a dupatta was an essential part of the dress of Indian women. It constitutes a healthy place in the value system of multiple religions of the country. The bollywood divas have welcomed this humble piece in the arena of fashion thereby starting a revolutionising journey of a humble dupatta to a multipurpose fashion accessory that is loved by one and all. Soon, the world witnessed a whole new range of dupattas on the fashion show ramps casting their unimaginable magic. Until very recent a dupatta was just a customary piece but not anymore. The variety of the dupattas can be credit to a bunch of reasons leading to a perfect wardrobe addition. 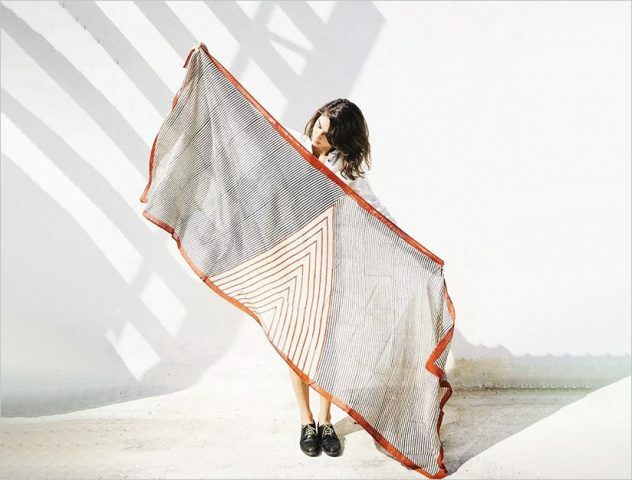 The final piece has a consolidated essence of the basic material, texture of the cloth, design and decorations on it. You can find a few varieties listed below for your reference. Khara Dupatta is considered to be the most elegant and sophisticated type of dupattas amongst all. This is used to add a majestic feel to the entire look of the wearer. The length of the khara dupatta is six yards long. The origin of the dupatta is based out of Hyderabad. 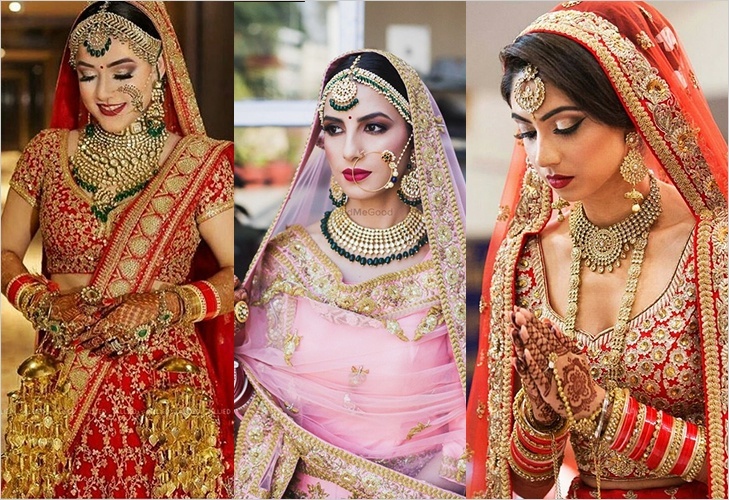 It forms an essential part of the bride’s attire on her wedding day. Bandhej Dupatta is very famous across India and world. They are also known as Rajasthani dupattas because of their origin. It is one of the most graceful form of garment that embodies art and culture of the state of Rajasthan. It is made with intricate embroidery done using traditional mirror work technique to depict the stories of caravans and their fling with sand dunes. Chiffon Dupattas are known as the heart of the textile and fashion industry. The high comfort level and the flow of the cloth material make it a perfect choice for the dupattas. Since the dupattas made out of chiffon are light and slippery you might have to pin them up to avoid them falling out of the place. 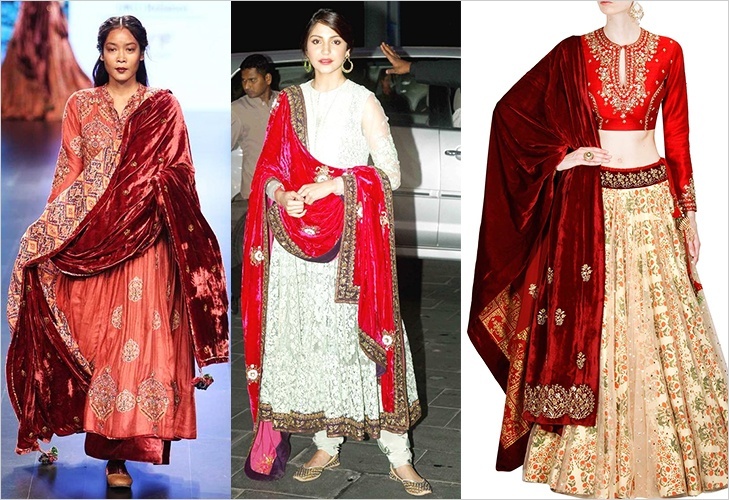 Sabyasachi Mukherjee, the famous fashion designer, made velvet dupatta a must have for all women out there. 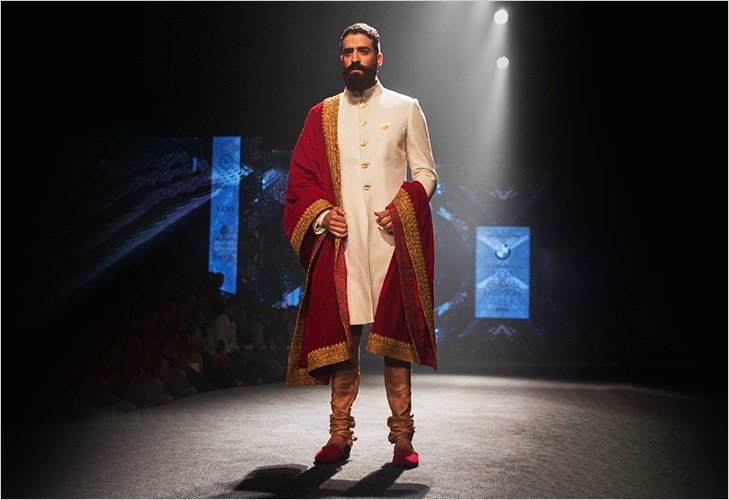 He introduced the velvet dupattas in his bridal trousseau. From there on it became a stipulated choice for anyone looking for a regal and rich look. The fabric is heavy to carry and difficult to maintain. It is an appropriate choice for special occasions but will be difficult for daily wear. The nature of the fabric makes it an ideal choice for the winter celebrations. If you are going for velvet dupatta ensure that your movements are not restricted and pair it up with light weighted ensemble. The art of Zarodazi work was brought to us by talented Persians. This art form was extensively used in the clothes specially made for the royal families and rich ministers. Today we can find it in the wardrobes of any fashion enthusiast. The Mughals deserves the credit for bringing Zardozi on the doorsteps of India and making Luknow the hub for it. In this complicated technique the threads are made up of an alloy of silver and gold. Thus, making the zardozi products expensive for a few. The beauty of zardozi art work is the patterns drawn by the artisans on the fabric. 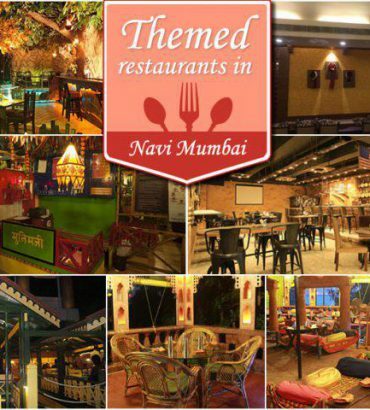 You will be awed at the intricacy of the floral motifs and the geometric patterns made by them. 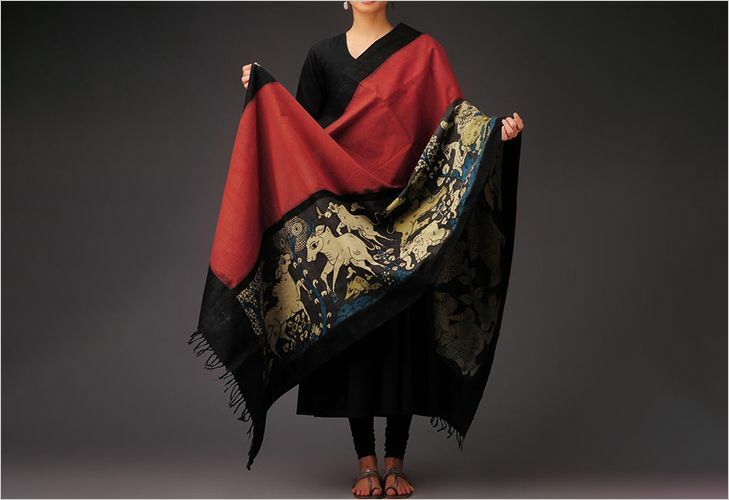 Kalamkari dupattas are a rage with all ages of ladies who wants to add something different to their look. It is the technique of painting with hands or using blocks to create designs. The process is done over premium quality of cotton dupattas and is produced exclusively by the states of Iran and India. The origin of the name is traced back to the lands of Persia. 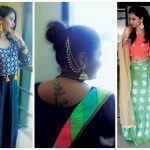 The kalamkari art has three types of art styles namely Masulipatnam kalamkari, KarrupurKalamkari and Sri kalahasti Kalamkari. As per the traditional guide for the apparels, dupatta is worn with salwar kameez, lehenga, churidar, sharara, garara etc. The style of the dupatta depends on the overall look you want to achieve in-sync with your dress and the occasion. A dupatta on its own is a complete accessory that can create a mesmerising look. It is that piece of glamour that can add exquisiteness without going overboard with tonnes of other accessories. A dupatta with heavy work or embroidery looks best with subtle kurtas and blouses. In such curated looks the talking is done by the dupatta itself thereby keeping all other elements muted. Statement jewellery or delicate jewellery can be paired with a simple dupatta as per the requirement of the occasion. The pro tip is to play with fabrics and colours to heighten the look for any desired event. Bollywood has played a pivotal part in popularising the dupatta and its versatile style. Traditional kurtas or kurtis paired with a well fitted pair of denim jeans and a vibrant dupatta can speak tonnes about your style quotient to the strangers. How about going for a colour block look with a deep hued dupatta and a white chickankari kurta or a red anarkali with a white mirrored dupatta? Breaking the monotony of any attire was never this easy and inexpensive to say the least. 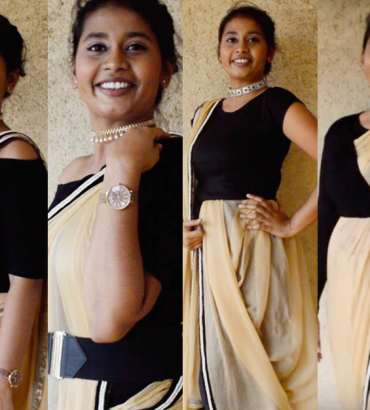 For a glamorous indo-ethnic a dupatta can be used with a dress to create a fusion look. Inculcating the chunni in your attire can add layers and some interesting elements to an otherwise boring outfit. The western counterpart of our very own dupatta is a scarf. Western ladies have long been using scarves to protect them from the sun, wind, winters or to add some extra oomph to their ensemble. Such scarves are usually mono tone and have varied lengths. The general usage is to tie them around neck, shoulders or around head like a bandana. 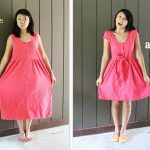 The newest diy hacks also suggest them to be used like a sarong or a skirt. Since the dupatta or a scarf is nothing but a piece of cloth therefore it can be tied in multiple ways to create a dozens of looks. Taking the inspiration from the lands beyond the seas Indian fashion designers have also started to experiment with draping techniques of dupatta for a more fashion forward look that is deep seated in our past. We can go on and on about the versatility of the dupattas or scarves and there will be no end to it. The fashion designers cherish them in their all forms. Either you wear it as a sarong or diy top on the beaches of Bahamas, a head gear on fashion runway shows, or accentuate your waist by tying it an elegant manner. You will never be short of ideas on how to play with the dupattas. Since the list is endless, just use your creativity for it. 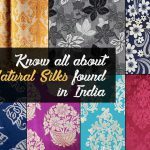 India has always been a nation that has boasted about her skilled artisans and the affluent history of handicrafts, with each region or states showcasing their unique style of handiwork. Therefore you are bound to get spoiled for choices to pick out your favourite one from such an exquisite collection of dupatta styles. So which one will it be? Lehariya chunari of Rajasthan, Pashmina dupatta from Kashmir, Phulkari dupatta from Punjab or Chikankari chunni from Luknow. Definitely a hard choice to make. How to take care of your Dupattas? It is very easy to maintain the beauty of the dupattas if certain instructions are followed. For the daily wear dupattas you can use a mild detergent. Before washing kindly ensure the fastening of the colours of the same to avoid bleeding of the colours. In case of a heavily embellished worked dupattas, dry cleaning is considered to be a safe choice to maintain the embroidery and stones. They are ironed directly and the temperature of iron depends on the cloth type of the dupatta. The beautiful saga of the dupatta’s is as old as the mankind himself. The clothing is used as an instrument to cast a spell and make a statement without using the words. 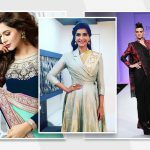 With such great variety and multiple styles of wearing it, dupatta is nothing short of ammunition if you wish to spike your fashion meter scores. A demure outfit can be given a character through a wisely selected dupatta. Investing in dupatta is not only cheap but a smart decision since it can help in creating multiple looks at absolutely no cost. Just a little mix and match and we have a diva becoming the talk of the tinsel town with her unbeatable fashion sense.